The global smart elevators and escalators market witnesses a consolidated landscape as a large portion of the global shares lie at the hands of few players, notes Transparency Market Research (TMR). Top players include thyssenKrupp AG, KONE Corporation, Otis Elevator Company, and Schindler Holding Ltd. These players have earned sizeable stakes in the market on account of their vast technological expertise and pervasive geographic presence, especially in developing countries. TMR observes that leveraging on this potential has enabled these companies to stay ahead of several of their competitors that include Siemens Building Technologies AG, Toshiba Elevator, Hitachi Ltd., Hyundai Elevator, and Mitsubishi Electric Corporation. The leading players are also focusing on making product innovations and in acquiring domestic vendors to garner competitive gains over others. The overall opportunities in the global smart elevators and escalators market is projected to be worth US$162.56 Bn, with smart elevators alone accounting for a revenue of US$150.03 Bn by the end of the forecast period of 2017–2023. During the period, the market is anticipated to expand at a promising CAGR of 6.8%. The various application areas for smart elevators and escalators are hotels, commercials, retail, residential, transportation, hospital, and parking buildings. Of these, the transportation and residential sectors serves the major share of demand in the global market in 2017. The segments are expected to retain their prominent positions in the coming years as well. On the regional front, Asia Pacific has emerged to the fore in the global elevators and escalators market. The regional market is projected to account for a share upward of 42.4% by 2023 end. The growth is driven by the burgeoning demand coming from the thriving real estate industry. The global smart elevators and escalators market is driven primarily by their substantial demand from the real estate industry. The rapid strides being experienced by infrastructural developments in emerging economies world over is a prominent trend propelling the growth of the market. The constant thrust on energy efficiency in high-rise buildings as well as low-rise and mid-rise building will bolster the demand for smart escalators and elevators. Several players of the market are increasingly benefitting from the rapid emergence of shopping malls, hotels, luxury apartments, and high-rise apartments in various developing and developed regions. The rising number of shopping malls has spurred the demand for smart escalators. The sizeable investments being made to boost airport and rail transport infrastructures in several developing and developed nations is also boosting the market. This is supported by the swift pace of urbanization in emerging markets. The rising integration of smart elevators with cloud technologies is aimed at dramatically improving their performance and comfort to users, opening lucrative prospects in the market. The rising popularity of green buildings and eco-friendly building infrastructures in developing and developed countries offers a robust impetus to the demand for smart elevators and escalators. However, the global elevators and escalators is expected to face restraining forces by the lack of compliance of escalators and elevators to prevailing government norms. The high cost of maintenance for these smart elevators and escalators has also dampened their demand among less-developed economies. Nevertheless, the vendors in the market will reap lucrative demand from emerging economies. The staggering rise in numbers of infrastructural projects in several developing economies in regions such as Asia and the Middle East is expected to pave for lucrative avenues for manufacturers and vendors. 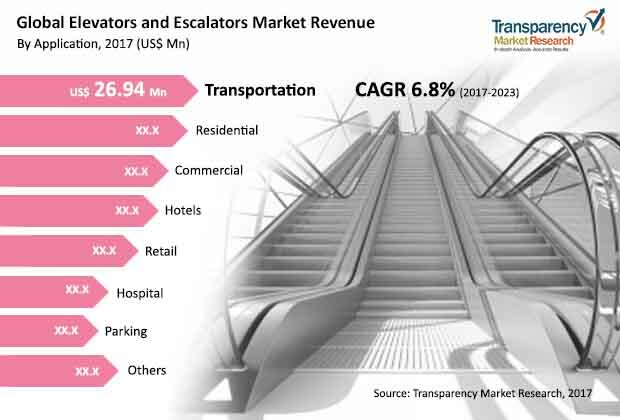 The study presented here is based on a report by Transparency Market Research (TMR) titled “Smart Elevators and Escalators Market (Type - Elevator (450 kg - 1,150 kg, 1,150kg - 1,500kg, and 1,500kg - 2,000kg), Escalator (Moving Walkway Escalators and Moving Stairs); Application - Commercial, Hotels, Retail, Residential, Transportation, Hospital, and Parking Building) - Global Industry Analysis, Size, Share, Growth, Trends and Forecast 2017–2023”.